"It is not so much the act that matters, but the consciousness in which it is done." Commit. Senior management must be engaged, including the senior managements of your suppliers. Expectations should be set and the program should be put into writing. These activities articulate the commitment. Create Awareness. The program and its goals need to be continually reinforced, setting the context with employees and the supply base. Develop a Web site; make the program an agenda item that routinely gets discussed and stays on people's radar screens. It's also important to share and sell the benefits of the program. Your suppliers should know that those who commit to your program will enjoy a larger share of the business. Communicate and Collaborate. Open communication and active engagement is much more effective than any policing actions. This communication leads to rapid improvement. Partnering for Success. Partnerships occur on several levels, including a) internal stakeholders (particularly those supplier-facing people), b) supply chain members, c) industry groups, d) government offices, and e) non-government organizations. Recognizing our responsibilities as industrialists, we will devote ourselves to the progress and development of society and the well-being of people through our business activities, thereby enhancing the quality of life throughout the world.. 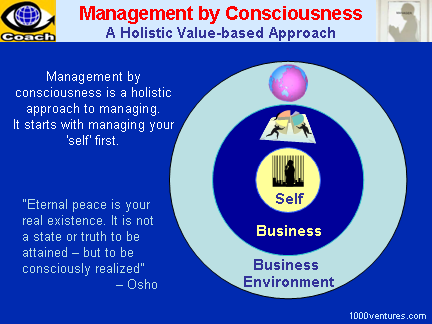 According to G.P Gupta1, management by consciousness is "an exercise in harmonizing men, material and methods toward the fulfillment of goals leading to human development, social benefit and global welfare." Use brain stilling when you need to arrive wisely and peacefully to a rational and enduring decision. To Panasonic's founder Konosuke Matsushita his mission of manufacture was to overcome poverty, to relieve society as a whole from misery, and bring it wealth. Business and production, to Matsushita, were not meant to enrich only the business owners, investors, employees or shops, but all the rest of the society as well. Matsushita never talked narrowly about maximizing shareholder value as the proper goal of an enterprise. Although he did speak often about generating wealth, his emphasized the psychological and spiritual aspects of being – for the good of all people. “Big idealistic / humanistic goals and beliefs are not incompatible with success in business. They may even foster achievement, at least in a rapidly changing context, by supporting those habits, which encourage growth,” Matsushita said. Source: Harvard Economic Review Summary by Anastasia Bibikova. “In absolute silence sleeps an absolute power”, says Shri Aurobindo.